First a pet peeve - why is it necessary to make a book glossy from cover to cover forcing the reader to heft over 3 pounds every time he or she reads it? 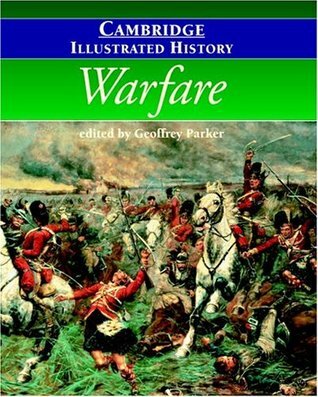 I have never had my arm muscles ache as much as with this 400 page book!Ok, on to content.Warfare is a comprehensive look at the way men have gone to battle since the rise of the West in ancient Greece. Using detailed diagrams when necessary, the reader can see how manpower was deployed and how weapons were used.Particularly interesting to me were the diagrams of the Greek phalanx and the Roman centuries, examples of the discipline and technique that along with technology helped the West to defeat opponents. Did you know that a major factor in the success of Alexander the Great was the ability of his troops to carry all they needed thus avoiding a long supply line and crowd of camp followers?This book is filled with insightful commentary on why armed conflicts turned out the way they did. Why was the huge Spanish Armada defeated by the relatively insignificant (at the time) English Navy? What was the Needlegun and why did it give the Prussians an advantage? How did Cortez with just a few hundred Spaniards defeat tens of thousands of Aztecs?The tide of battle can be turned by weather, by leadership or the lack thereof, by technology and other factors. You will find yourself on an informative march through over 2000 years of conflict up to the 1991 war in Iraq. On finishing this book, I wondered how the Bush directed "war of choice" in 2003 would be seen by such a history as this.As one would expect, more recent wars are treated in more detail with excellent accounts of WW1 and WW2. Happily, the book doesn't get bogged down in detailed maps of tactical movements of armies on the field unless it aids in making the reader aware of some new battlefield technique. Likewise, there are no long discussions of particular weapons. The goal is always to ask - how did things change and why?Provided you work out at the gym to build up your biceps for this brick of a book, I think you will be rewarded by the fact packed, concise writing supported with excellent illustrations. In war, victory or defeat can happen as a result of unpredictable factors but, over time, superior practices and technologies have a telling effect. The persistent rise of the West was no accident. Read this book to find out how it happened. Williamson Murray's extremely biased chapters bring the whole book down. Starting with the infantry of the ancient Greeks, this book endeavors to explain the social, political and military tactics that enabled the West to dominate everyone they came in contact with. Both brief and detailed this book is dense, the pictures and diagrams help to keep the reader on track.Why I started this book: It was one of my goals for this year, and I knew that I would need time to make my way through it.Why I finished it: I did a big push at the end, I wanted to stop hauling with large book around. Plus I am more familiar with the wars of the last century. It was a good introduction and I was surprised with the authors candor about the necessity and costs of war. Most surprising was the comparison between Hitler and George W.; both started costly wars despite the protests of millions. Great comprehensive textbook covering military history from its roots to the modern age. It is easy to read, has great pictures/charts/diagrams and is solidly researched as it comes from one of the preeminent military historians in the world. Overall is a your standard history reference book on warfare. Used it in my War and Civilization class and found it useful when writing papers during the course. Its a fairly detailed book and has great illustrations in this version that makes it a whole lot more fun to read. Use it occassionally as a text book. Wish I didn't have to. Uneven as a general introduction.